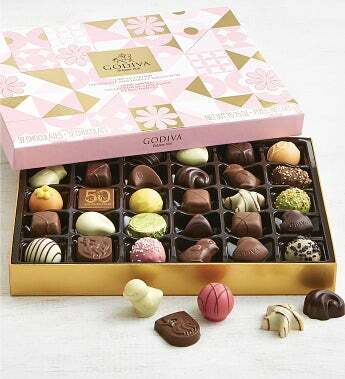 Godiva's 32 piece Spring Chocolates Box is the perfect spring treat for Easter, Mother's Day, and more. This elegant limited edition box from Godiva features an artistic pink and gold metallic design tied with gold ribbon. Filled with an assortment of classic Belgian chocolates in milk chocolate, dark chocolate, and white chocolate plus limited edition chocolate truffles, there's plenty to be savored and shared. There are four exclusive chocolate pieces from Brussels: three Milk Chocolate Orange Chicks and one White Chocolate Hazelnut Chick. This chocolate gift box is sure to add delight and surprise to every occasion. Gift measures 11.5" x 8.75" x 1.5"